La Plata County Commissioner Gwen Lachelt will speak** before the state’s oil and gas regulators Tuesday as new questions arise about the embattled official’s advocacy efforts on behalf of conservation groups and local decision making. The commissioner faces a recall in her home county that is now in the signature-gathering phase. Questions about Lachelt’s multiple roles—as an elected county commissioner and as the founder of a new advocacy organization—appeared after her lobbying efforts in May 2017 against the Bureau of Land Management’s methane rule gave rise to an ethics complaint and local concerns about conflict of interest. Lachelt helped launch the Western Leaders Network as Executive Director in early 2017. The group adamantly opposed any change to the BLM methane rule, with Lachelt appearing as a La Plata County official at a press conference alongside Sens. Michael Bennet (D-Colo.) and Maria Cantwell (D-Wash.). Last month, Lachelt addressed the Colorado Oil and Gas Conservation Commission, saying she was there as “myself and on behalf of the Fitzgerald’s and not the La Plata County Commissioners,” at a hearing on flowline rulemaking. In a prehearing statement dated December 4, 2017, Lachelt, along with James and Theresa Fitzgerald, filed comments and a request to speak at the January COGCC meeting. The Fitzgeralds are featured prominently on Earthworks’ website as local activists. The Oil and Gas Accountability Project, an Earthworks government reform program, is also scheduled to speak. Lachelt was the founder and director of OGAP, according to her online biography. James Fitzgerald and Lachelt both served from 2014 to 2015 on the Colorado Oil and Gas Task Force. Lachelt co-chaired the committee. When asked to clarity if she will be testifying in her role as a county commissioner or on behalf of another organization opposed to oil and natural gas production, Lachelt did not respond to Western Wire by deadline. “I have been elected twice – first in 2012 and most recently in 2016. I’m term-limited. A special election is not only a waste of taxpayer dollars, it is also a subversion of the democratic process,” Lachelt wrote on her website regarding the recall. Lachelt has asked for residents to “decline to sign” and for donations to fight the recall. She blames a “well-funded and well-orchestrated” effort by groups like Americans For Prosperity, who are funded by the Koch Brothers. Lachelt also rejects allegations of ethics violations and conflicts of interest. A Western Wire open records search yielded expense and reimbursement records showing no indication that her public business trip to Washington, D.C. in May 2017 was paid for or reimbursed by county funds, despite Lachelt’s assertion that she was there on official La Plata County business. According to Lachelt, costs associated with the May 2017 trip were paid by Western Leaders Network. Lachelt described the trips to Washington as part of both her official role as county commissioner and as a representative of Western Leaders Network. “In reference to the trips I took this year to DC to advocate for the methane rule – all travel expenses were covered in the Western Leaders Network budget,” Lachelt wrote. As the group’s founder and director, Lachelt confirmed she was paid a salary by the organization. The Eagle County Attorney’s Office investigated an ethics complaint and found no evidence of wrongdoing last October. However, La Plata County has undertaken ethics policy reforms set go into effect this month, after recommendations from the Eagle County Attorney’s Office following the investigation. “The question is significant,” the editorial board said. 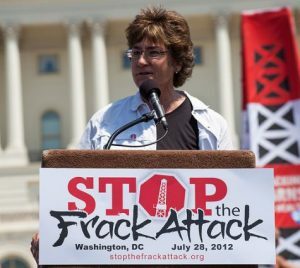 They pointed to her previous work with the San Juan Citizens Alliance and her role as founder and Director of Earthworks’ Oil and Gas Accountability Project. The editorial board also wondered if the needs of Western Leaders Network—and the eight states it serves—would conflict with Lachelt’s responsibilities in her home county, or hinder her ability to work with industries affected by Western Leaders Network’s advocacy. This isn’t the first time Lachelt’s employment and advocacy have blurred lines. In 2015, a campaign contribution by Lachelt to her own re-election campaign listed Earthworks as her employer while serving her first term as county commissioner. Lachelt promised to correct the record. Recall organizers have until March 30 to collect 7,505 signatures to initiate the special recall election. If verified, a 15-day protest period will begin, followed by the opportunity for Lachelt to submit a letter of opposition to the recall or resignation, according to the Herald. **Update: La Plata County Commissioner Gwen Lachelt informed Western Wire by email she would not be appearing at Tuesday’s COGCC hearing, despite being listed by name on the COGCC agenda for closing statements.